Some of the links in this post are affiliate links and I receive a small commission if you make a purchase using those links. This does not cost you any extra at all! I appreciate your support of this blog by shopping through my links- thank you! This is not a sponsored post, I did not receive these planners in return for a review. I don’t know about you, but staying organized and on point can be a tad bit difficult. I often get lost in the noise, or on Facebook. Every December, I focus and build a plan for the next year. I have Excel spreadsheets for miles and tend to stay on track until about March. Then something happens and I forget about my plans, notes, and goals for a couple months. I started to do a bit of research into why this was. As a full-time traveler, everything I do is digital, as I gave up paper a few years back. This past summer, I wanted to journal offline and on a whim bought a $3 Star Wars Composition Notebook at Target. Every day I would write down three things I was grateful for, what I wanted to accomplish that day, and how my mood was. I loved it! Sadly, the humidity in Costa Rica had a field day with Yoda, and hard to believe, but the humidity won. I found all three of them on Target.com for $2.50 each. They say writing things down impacts our psyche more than just seeing the words on a screen or saying them out loud. For me, this was true. Whenever I wrote things down with pen and paper, I accomplished more and felt like I was making progress by physically checking things off my list. Now this next year, I am not completely dumping my spreadsheets for a paper planner, but I am going to merge the two together and see how that works for me. I’ve been researching a ton of paper planners, and came up with the ones that are the best on the market. I also looked at various apps and online tools to help busy bloggers and travelers stay on track. This post is as much for me as it is for you – maybe together, we can stay organized in 2016! The Erin Condren LifePlanners is the one planner that most of my blogging friends have. It is pretty diverse and comes in three formats: Vertical, Horizontal, and new this year, Hourly. It is used as a daily and monthly organizational calendar, journal and memory book, plus there is space for meal planning and logging different exercises. The Life Planner is available with 75 different cover designs with the option for personalization and color schemes on their website. The 12-month LifePlanner costs $50-75 with basic personalization plus $7.95+ shipping within the US on their website. I liked watching the video to get a feel for the planner and which layout I would like the best. I’m stuck between vertical and hourly! I think the vertical will win out as I can use those three breakout spaces for blog and travel planning. I can add a label on the top of each section, like what posts need to be written or To Do Lists needed for my next adventure. I’ve seen some other blogger and travelers layout ideas for this planner, and they are pretty awesome. When you are ready to purchase, use this link for $10 off your planner. You have to sign up for their newsletter to qualify for the discount – that’s it! The Emily Ley Simplified Life Planners are also quite stellar. The Simplified Life Planners, which are spiral bound, come in three covers and are either daily or weekly, ranging from $40-58. What’s different about the Emily Ley line is that there is also a binder version so that you can add pages or take out ones you won’t use. This version has me seriously intrigued as you can add additional printables, like a Pinterest To Do List, and have everything organized into one place! Emily Ley also has a wide range of free printable downloads to add to the planner from packing lists, meal plans, and a blog planner. Emily Ley also has an iOs app that corresponds to iCal taking the next step to tying our digital and paper worlds together. The Whitney English Day Designer has seven covers to choose from and is spiral bound. 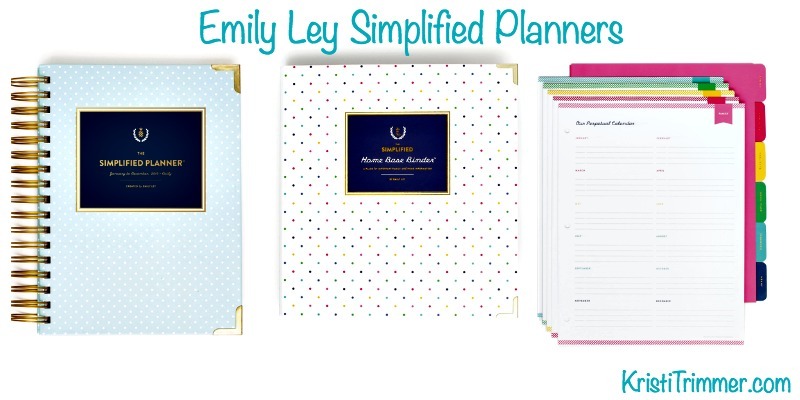 It is honestly very similar to the Emily Ley Simplified Planner in size and design. The interior pages are a tad different, so that is where you will want to look to see which one is right for you. Their planners are $58 and there are free downloadable printables like bucket lists and even an entertaining checklist that I loved. Of course, I downloaded over 10 of the printables and tested them out! I liked that they were very streamlined and helped me to keep goal-focused. The Day Designer has daily quotes and is beautifully designed. You cannot go wrong with this planner, especially if you are a busy entrepreneur trying to get on top of your daily and weekly tasks! A relatively new planner on the market is the Passion Planner, which debuted in 2014 as a Kickstarter campaign. I downloaded their free printable version to give it a shot to see how it would work for me. For those of you that are mindful about goal setting and need encouragement and advice in order to stay on track, then the Passion Planner would work for you. It is a bit more structured than other planners I’ve seen, but that corresponds to its mission to help you achieve your plans and goals through visualization. It’s available in dated, undated, and an academic planner and is good for those that enjoy more structure in their life and in their planner. Very new to the planner market, like it was just launched a couple days ago, is the Wonderlass Blog + Life Planner available for $47. This one is a bound undated book that is made specifically for bloggers! Not only is there space for you to write out your personal Bucket List for the new year, but also one for your business, including a business plan. What I loved was the space to record blog and social media stats. This is a very colorful planner and it embraces the inner weirdo in all of us with its quirky drawings and quotes. This planner is perfect for that blogger that loves creativity and needs space to do their own thing. No matter which planner you decide to go with, I can already see that the planner accessory world is alive and quite active. It’s giveaway time! 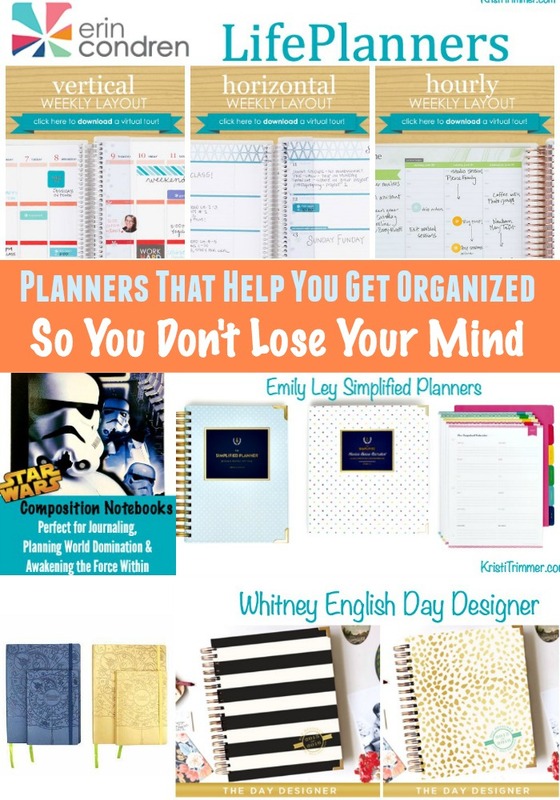 I’m purchasing the Erin Condren planner as well as the Star Wars Composition Notebooks for 2016. I want to share this Erin Condren journey with you. The Erin Condren Planner Giveaway will run until Monday, December 21, 2015. One winner will receive a $50 ErinCondren.com electronic gift card. I’m sponsoring this giveaway, not Erin Condren. Good luck! Love my EC! Definitely need to grab one for 2016. I would use an EC planner to organize life with 3 kids! with three kids an a busy schedule all the help is needed to stay organized. I haven’t revisited electronic organizers since my last one bit the dust but interested in learning more now. Just a side note on paper planners I remember my kids always got one from high school and never used it, so I did., I really liked their layout as it was detailed and hourly…………. I like electronic just because I can sit at my computer and organize but you can’t take your computer everywhere (miss my palm pilot) so I double with the books (which I still tend to do hourly) I use my phone to double check my paper copy or visa versa. It is crazy how personal a decision it is! I was convinced to go with Erin Condren after I saw this post and how she used the vertical layout. I think for you the hourly layout may just be perfect http://www.prettyneatliving.com/planner-overview-october-2015/ You can also buy the coil rings and add additional pages right into the planner. I’m going to do that with the Pinterest planner and others I’m going to make for me specifically. Let me know if that will work for you. I will use it to keep up with our appointments and homeschooling schedule! I’m in need of a new planner for 2016. The life planners look really neat. I love the horizontal layout. I’ve been wanting a better planner for quite some time now (I have a very basic one from Target), but I can’t get pass the price! I fear that if I get one, I won’t get all of the full benefits. I love these recommendations and will definitely be revisiting this post! I love planners and anything else stationery-related so this is a great post! I’ve been eying off the Erin Condren planners for a while now, but to ship to Australia and convert from USD to AUD means they end up being very expensive. My Kikki-K planner might have to do for just now. Thanks for the planner post! I’ve been looking into getting something different from what I am using for 2016. I love my Day Designer! I’d be lost without a planner. I’m still deciding which one to get, so I really appreciate this post! I would use the planner to help organize and track orders for my new small business. I have been blogging for over 5 years and have never been serious about using planners. Last year I used one for a little while, and then quickly stopped. This new year is going to be my year to get more organized in all parts of my life. I plan to do that through the use of a blogger planner to help map out my year. OMG, yaass!!!! 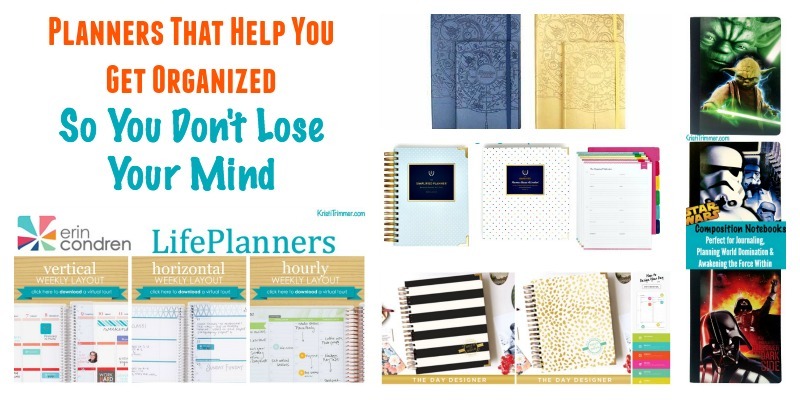 organization makes my world go round and I love the different options, especially the life planner ? To organize all my appointments! To keep better track of blog projects! I would use it to keep my family life organized. I’m hoping this will be the year that my planner helps me get my blog organized! I’ used journals to write to do lists on but i think I’d really like to use a planner to keep me organized. Love all the different ones you’ve reviewed here.